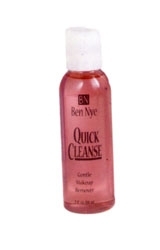 Ben Nye's very popular and improved makeup remover. A lighter formula yet still effective on all types of cream style makeup. Gently massage this cleanser into makeup. Wipe away, repeat if necessary, then rinse with water. Expect 4-20 applications per ounce. Unfortunately, due to FAA regulations this item cannot be shipped Next Day Air, 2nd Day Air, 3rd Day Air, or International. Please refer to our shipping times to determine the approximate shipping time of this product.